* Function: suitable for indoor or outdoor use, Halloween party, costume party and haunted house décor. * It looks reality, you could use it to decorate your house, yard or shop, making Halloween atmosphere more horrible. 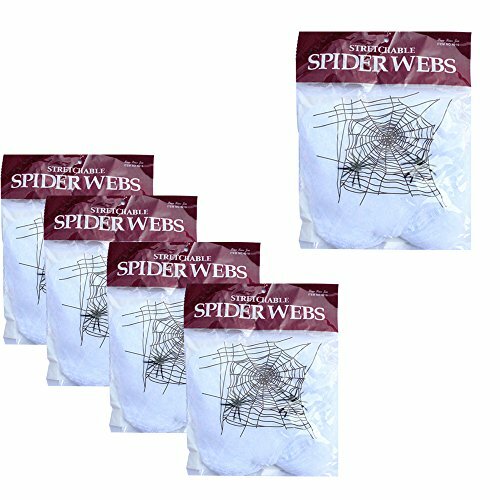 * 11-135 inches long durable artificial stretchable spider cobwebs, 2 mini spiders are included. * Made of polyester blend to survive bad weather, and it can be attached to anything easily. * Terrifying spider web halloween decoration, your neighbors won't go anywhere near your house with this terrifying spiderweb. * For added spookiness and creepiness pull, stretch and design your room, place in tables, chairs, window and doors. * 30 days warranty after you received order, because of the holiday rush hour, pls choose the one fulfilled by Amazon to get the parcel in time, if the product is not fulfilled by amazon, pls make order a month in advance. If you have any questions about this product by WasonD, contact us by completing and submitting the form below. If you are looking for a specif part number, please include it with your message.